The Cockroach Catcher: Puerto Rico & Ponce: Pre-Raphaelites! Puerto Rico & Ponce: Pre-Raphaelites! So we spent a week in Puerto Rico before our Caribbean Cruise thinking it will be food and beach adventure and some Spanish historical sights. Imagine our surprise when we were told that the Ponce Museum of Art is a must see. This Caribbean Island Museum has one of the best collections of Pre-Raphaelites. Yes, Pre-Raphaelites. 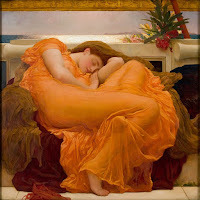 We did not get to see The Flaming June as it was back home in London. Frederic Leighton, Flaming June, 1895. Courtesy of Museo de Arte de Ponce, The Luis A. Ferré Foundation, Inc.
Anorexia Nervosa: A Profound Secret & Pre-Raphaelites! NHS: The Last Sunset & The Last Cook. Spring: How to save our NHS!